Hello, Patricia here today. I have been playing around making Christmas cards using some of my new dies from Dies R Us. And today I would like to share a very special one that I made to share it with you. I used the Nativity Bell from Tutti Designs and Snowflake Collage from Memory Box . 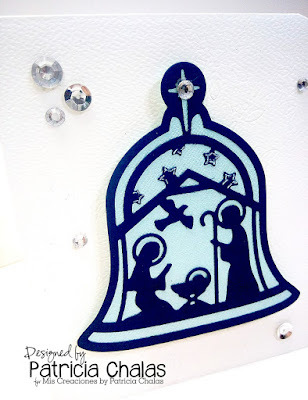 I first die cut the Nativity Bell using navy blue cs and then cut all around a pearled light blue cs and layered on top the navy die cut. Let my share a tip with you guys.... did you now that you can use your Dies R Us as to emboss on your same as you would use your embossing folder ... well so I used my Snowflake Collage to emboss my white card, used it twice. I like the soft look on it! it seems like the cs came like that. On my white base card front. I added some silver sequins and clear rhinestones to the base and on top of the Star of the Bell. 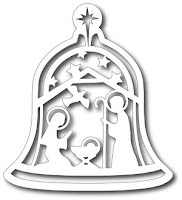 I layered the Nativity Bell die cut on top of the base using some dimensional foam. Cut the right top corner. 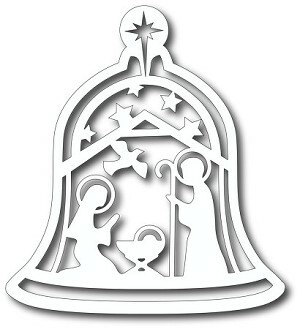 I love this card, this is my first Nativity Bell christmas card but sure it will not be my last! I hope you look around and check all the great Dies that we carry!! on our Dies R Us Inspiration Blog using a variety of dies from several different companies. Then of course you'll want to come join us at the Dies R Us Challenge Blog. a gift voucher prize to one lucky winner each challenge! OH! And did you know we have a FB Page and PINTEREST Page? I love this Clean and Simple Christmas card. The embossing is a great idea for the background and the sequins and rhinestones are perfectly placed. Beautiful Patricia! I agree with Janice that the CAS design on this card is perfect! That is one BEAUTIFUL die!!! Great way to show off the dies........bold colors and as a focal point on a CAS card. Just lovely. Thank you all for your commemts! 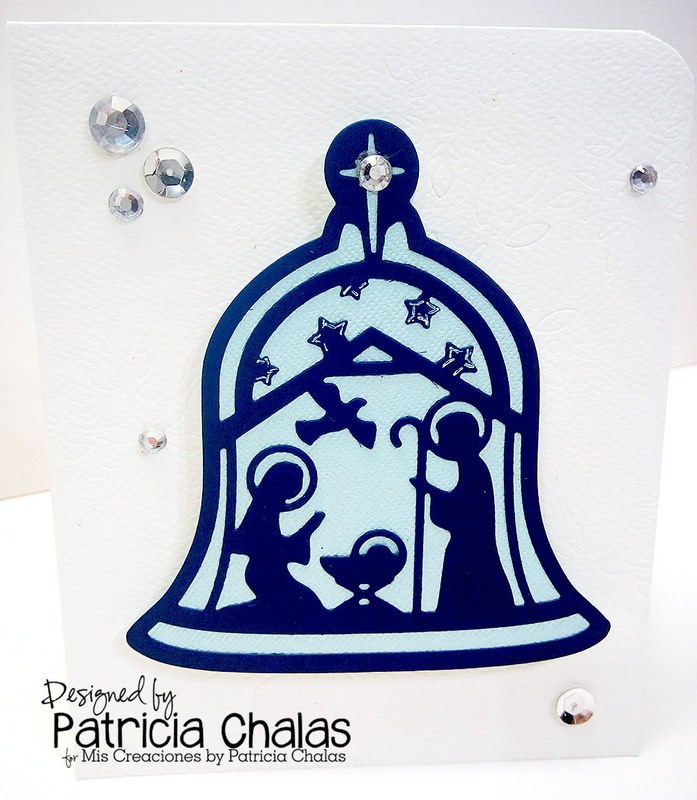 Bells and nativity, such a great combo for this die and love your snowflake background! More Under The Sea Fun! It must be snowing somewhere . . .